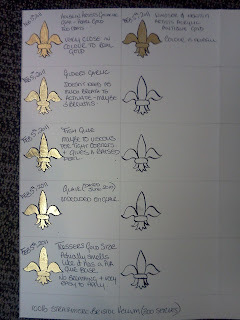 This is an ongoing project as I learn gilding techniques and better comprehend their application. As part of my own experimentation I have used supports that I am likely to use in a real application, 230gm pergamenata and 100lb Strathmore Bristol Vellum. 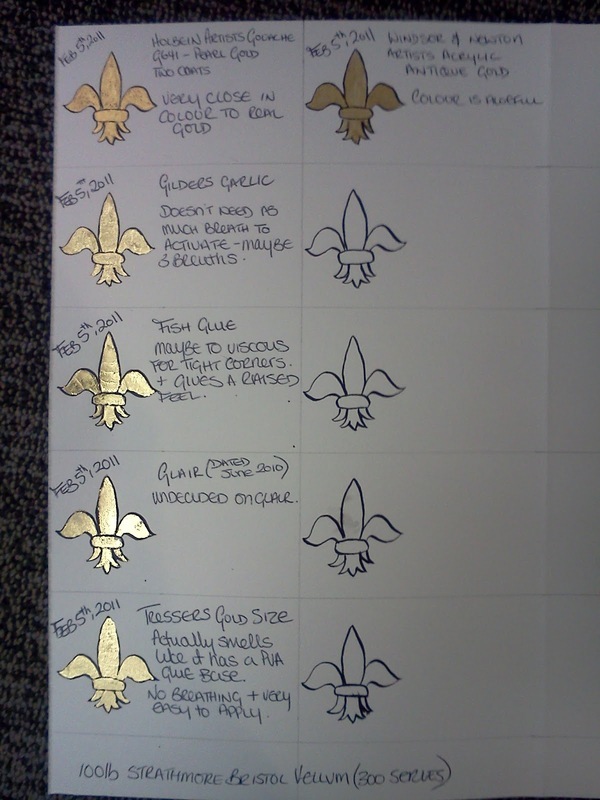 My intent is to also make a similar test page on parchment when I get the chance. I am testing both modern and period mordants and paints. There are sources detailing how to make period mordants for gilding, most common of which is Cennini’s Il Libro dell' Arte. My intent is to experiment with the various recipes so that I can make my own batches from scratch, however, since I wanted instant gratification I have so far been using mordants purchased from others. 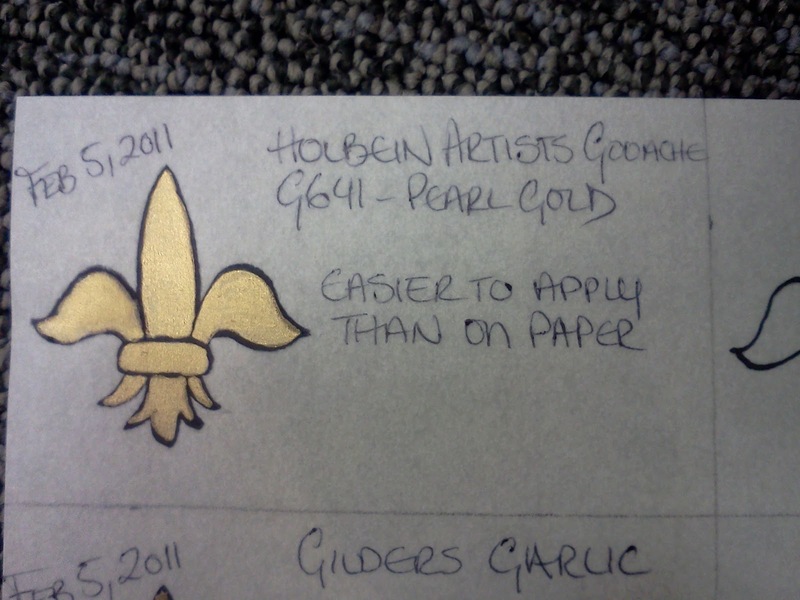 Updated December 2012: Added information regarding my initial use of purchased gesso. 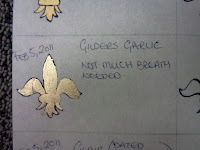 Updated October 2012: Added initial thoughts on garlic/glair mixture. 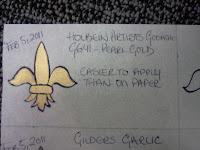 Updated August 2012: Added my findings regarding initial tests of an acrylic-based modern gesso. Updated July 2012: Minor edits. 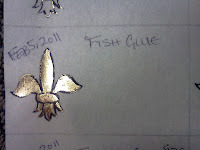 Updated May 2012: Added early findings regarding the use of a fish-glue / water mixture, and also Kolner Miniatum. Updated Dec 2011: Added photographs and re-edited body with more up-to-date information. I think Kathleen P. Whitley best describes why manuscripts were gilded, “As long as books were written by hand in the laborious process that made them both rare and valuable, manuscript gilding flourished” (Whitley, 3). Strictly speaking a manuscript can only be termed illuminated if it makes use of gold or silver, however the term is commonly used to mean any manuscript that contains decoration. The use of gold in manuscripts signified importance and was a means of displaying wealth, and by extension power. 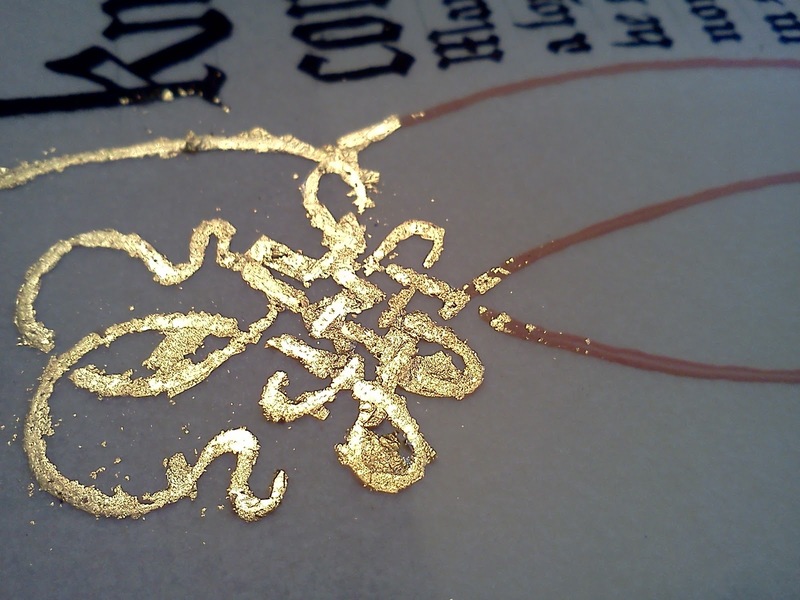 Gilding is an art of its own, and with the appropriate techniques can be applied to practically any surface including the pages of a manuscript. Due to the pliability of the page and properties of the mordant, some are more appropriate than others. Through extended use I have found that this modern, water-based paint gives a very similar colour to the 23k gold leaf I commonly use. Originally I found the dried result to appear streaky, however with improved application technique I have achieved a consistent, slightly raised finish. Experience has taught me that the paint needs to be very wet in the palette-well but only soaking a small amount onto your brush. Make sure to mix the paint often, so as to keep the pigment consistent. When applying to the page it is best to work wet-to-dry by dabbing your freshly loaded brush onto the edge of the most recently painted area, essentially applying wet-to-wet. Once the fresh paint has run off the brush, begin to gently pull the paint towards the dry unpainted areas. You are dragging the paint outwards with the tip rather than painting with the full length of the brush. You want to drag the paint out just enough that you no longer have large watery areas, which will cause the page to crinkle, but not so much that it becomes to thin. Although I have experimented with this paint using the above techniques, I continue to find it quite “gloopy” and difficult to apply. I've never been able to achieve consistent results that I am happy with, and I always seem to get a grey halo around the applied areas. I am currently in the process of collecting gold scraps so that I can make my own. Gilders garlic is by far my favourite mordant to date as I find it easy to apply and really like the effect it creates on the page. However I have found that it reacts quite dramatically to moisture and temperature changes, not only during application but also continually afterwards. UPDATED FINDINGS - My gold test-pages traveled with me to Pennsic 41, where they were subjected to the unruly heat and humidity. Upon returning I found that the gold applied with garlic on my perg. sheet had stuck to the opposite side and ruined the application. This is now a visual representation of what happens with the garlic mordant under those conditions. 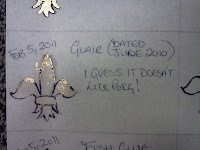 I have had mixed results using glair as a mordant for gilding, sometimes it works great and other times it just wipes straight off. Experimentation of its application and use is on going. 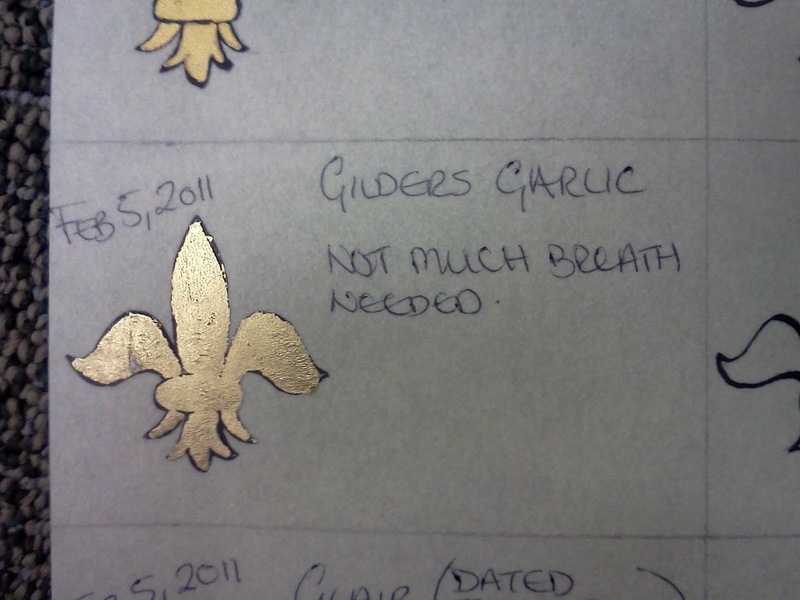 On a whim I decided to use a garlic/glair mixture for a scribal project because 100% garlic had proven to be even more sensitive to moisture changes on goat parchment than I had experienced on paper or perg. I used a 1:1 ratio and found that I needed to add some Armenian Bole to the mixture for colour, something I never needed to do with 100% garlic. The mixture applied with ease but I did find that I needed to regularly stir the mixture to keep the pigment (and I imagine the liquids also) evenly distributed. When applying the gold leaf I found that more breaths were needed to achieve an appropriate tackiness, somewhere in the region of 3 - 5 breaths. This was a vast improvement from the 100% garlic which was only requiring half a breath! As a caution, excessive tackiness caused the mordant to penetrate through the gold leaf and stick to the glassine paper I use in my application method, this has the potential to ruin the surface and spread the mordant to unwanted areas. 100% fish glue on perg. Basically boiled fish-parts, fish glue is super sticky and will make a mess if given the chance. 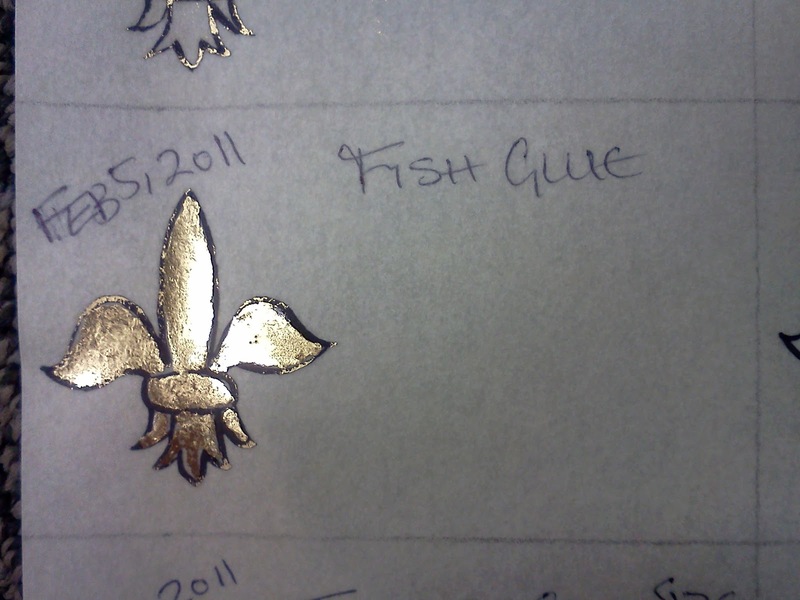 Initially I had great success with 100% fish glue, it went on the page nicely and created a somewhat raised pillow for the gilding. However as the seasons changed and the temperatures started to get colder I started to experience problems. Firstly, I was experiencing cracking of the mordant, making it very brittle and in some cases falling off the page completely. The second problem I encountered was that the glue was not adhering to the page at the edges of the applied area, almost like it was curling away. This was happening on both the Bristol Vellum and the 230g pergamenata that I use on a regular basis. After a lot of reflection and discussion with others, I have come to the conclusion that 100% fish glue is to thick for a consistent success rate. It's high viscosity is likely the cause of it pulling away from the page at the edges of its applied area, while drying quickly under cold temperatures is likely what causes the cracking. I am also under the belief that preparation of the surface to achieve a good tooth for the glue to bond with is equally as important. After the reflection and discussion concerning 100% fish glue, I believe that a glue/water mixture could create a pleasing result. Experimentation of its ratio, application and use is on going. My first use of a fish glue / water mixture seems to be a success. In a small container I mixed fish glue with enough distilled water to make it the consistency of maple syrup, then to this I added some Bole for colour. Application to the prepared pergamenata surface seemed to be similar to that of using paint. Initially there were quite a few air-bubbles in the liquid from preparation, these transferred onto the page and didn't dissipate and as such I had to dip my brush into the container where there weren't any air-bubbles. This proved to create a better application, all the while the air-bubbles in the container continued to dissipate. I would recommend mixing the mordant and then allowing it to sit for a little while so this dissipation can happen. Application of the gold leaf seems to be the same for that of the other mordants, although I seemed to need more diaphragmatic breathes to activate the tackiness. Many manuscripts have a high-shine, three dimensional form known as raised gilding, and is achieved with what is known as gesso - a mixture of slaked plaster layered onto the designated areas to form a pillow for the gold leaf to be layered onto. 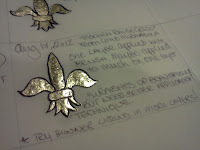 The gesso needs to be incredibly smooth before applying the gold leaf or every imperfection will be noticeable. Although I have read about these techniques, I am only now beginning to experiment with them. Modern Raised Gesso on perg. Purchased from Guild Mirandola, this gesso has a modern acrylic base and is non-toxic. Due to it's acrylic base, it needs to remain in liquid form in an airtight jar, as once it has hardened it can not be reconstituted like traditional gesso. When applying the gesso, I found it to be a little to viscous for my tastes, however I wanted a "pure" application as a baseline. Just as I did with the Fish Glue, I will try a diluted application at some point to see if this gesso flows more easily from the brush. I'm fairly pleased with the results from my rushed application, even if my technique leaves a lot to be desired. The gold-leaf buffed to a very nice shine, and to date it is the closest I have gotten to resembling that seen in the manuscripts. It was bright, shiny, and looks puffy on it's pillow. My results, when applied to paper, were a little less pleasing but still of good quality. For a while now I have had two gesso tablets in my supplies, purchased through John Neal Booksellers. They are made by someone called Ken Harris, whose instructions say that they are based on traditional recipes for gesso and include white lead as an ingredient. The instructions say that to reconstitute the tablet, place it in a small dish, break it into pieces, add a couple of drops of glair and leave it to soften before adding a few drops of water to attain a pleasing consistency. Ken Harris gesso applied to perg. 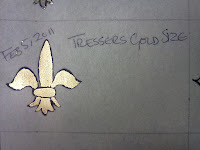 On a whim I decided to use this gesso for the gilding on [this piece - update when appropriate] as it wasn't to involved. I reconstituted the gesso so that it was about the consistency of maple syrup and chose to apply it to the page with one of my (crapy!) Speedball nibs. Drawing the pen-lines worked very much like it does with regular ink, although I quickly found that I needed to feed gesso back into the lines are my initial pass so that it formed a more visible pillow. As the liquid dried I started to notice that the outer edges on the line were drying darker than the interior section and could only assume that the edges were raised higher than the interior. You should be able to see this in the photograph if you look closely. 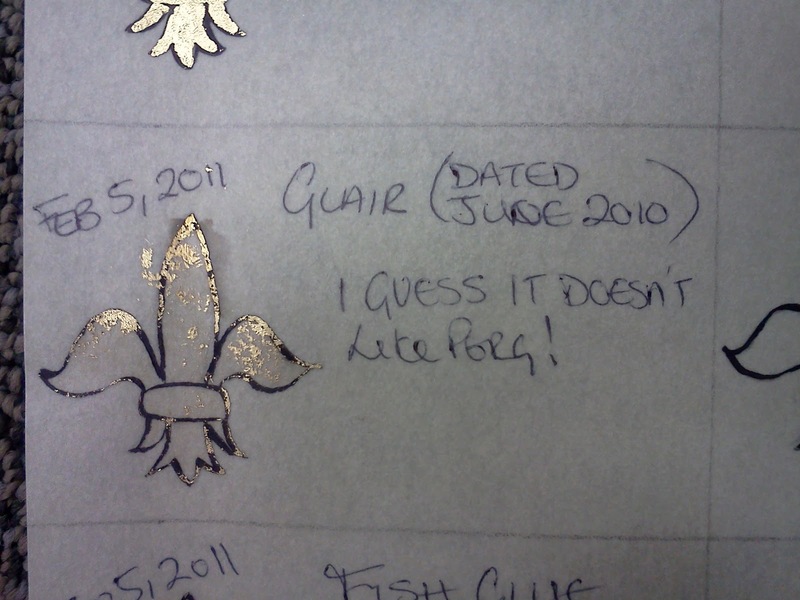 This was confirmed later when I started gilding and had problems getting the gold-leaf to stick to the interior even though it was sticking to the edges. To activate, I found that 5 - 7 diaphragmatic breaths were needed. I'm happy with my initial results, but need to try it on a larger area like I have with my other tests. 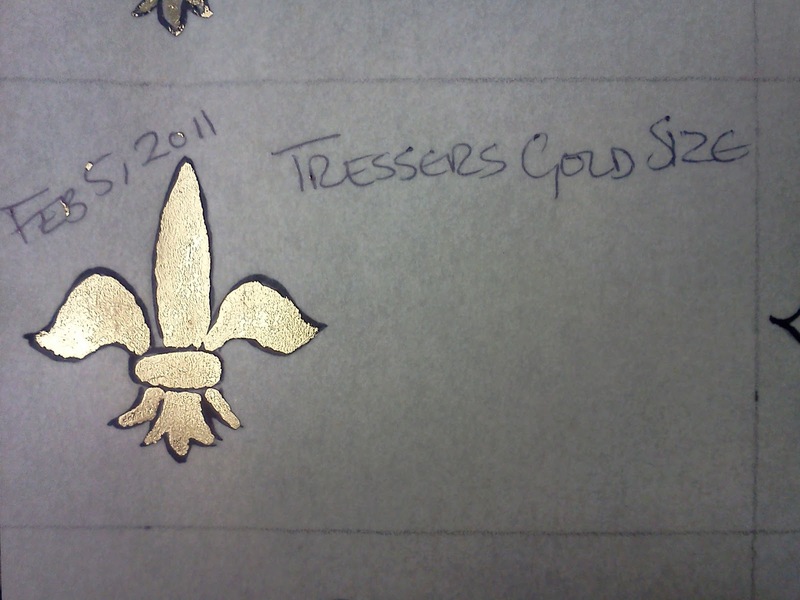 Tresser's gold size on perg. 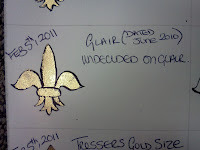 Purchased through John Neal Booksellers, this was the very first mordant I used for gilding. It is a thoroughly modern recipe, has a very distinct PVA glue smell to it and accepts gold wonderfully which results is a very flat, even finish. I have consistently had great success with this product, and I still use it occasionally, but have chosen to experiment with more period mediums. [...] The minimum drying time is 3-5 hours depending on the thickness of the layer of Miniatum, the temperature, and the humidity. (Composition Metals require a shorter drying time.) The material remains open for gilding for the next 20 hours. You may find that you get a better finish with overnight drying. [...] Once the Miniatum has passed its open window, gold will not adhere to it. This leads me to believe that my test pieces will not accept gold-leaf now and I will have to start over in the process for this mordant. Applying the gold leaf: Firstly I apply the mordant to the designated areas using a pooling and dragging technique, always working wet to dry. While the applied mordant is drying, I gather all of my various materials and tools so that they are close at hand when needed. 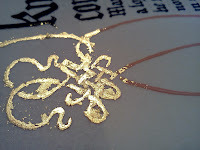 I dust my hands and scissors with 100% talcum powder so that the gold leaf doesn’t stick to either while I am cutting a it into much smaller pieces. Working in small areas and using tweezers to hold a small piece of gold leaf in my right hand, I diaphragmatically breathe onto the mordant, usually about five to seven times to make it tacky. 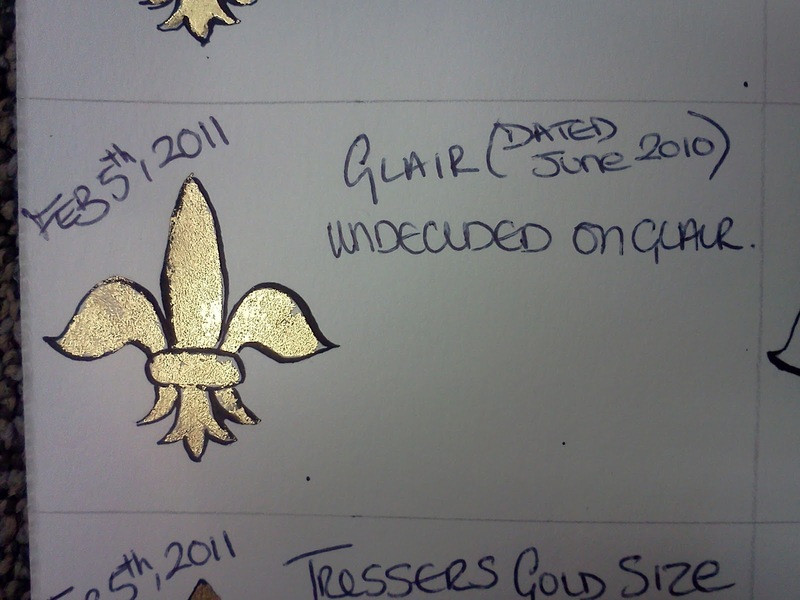 Immediately I apply the gold leaf and lay a piece of glassine paper on top, I then gently press down on the gilded area to help it “stick” in place. The glassine and paper backing are carefully removed before repeating the process over the entire area. Once I have finished gilding the entire area I will lay a fresh piece of glassine paper over it and begin to gently rub with my burnisher. Once I have finished burnishing I gently polish the gilded surface with a piece of silk cloth wrapped around my index finger. 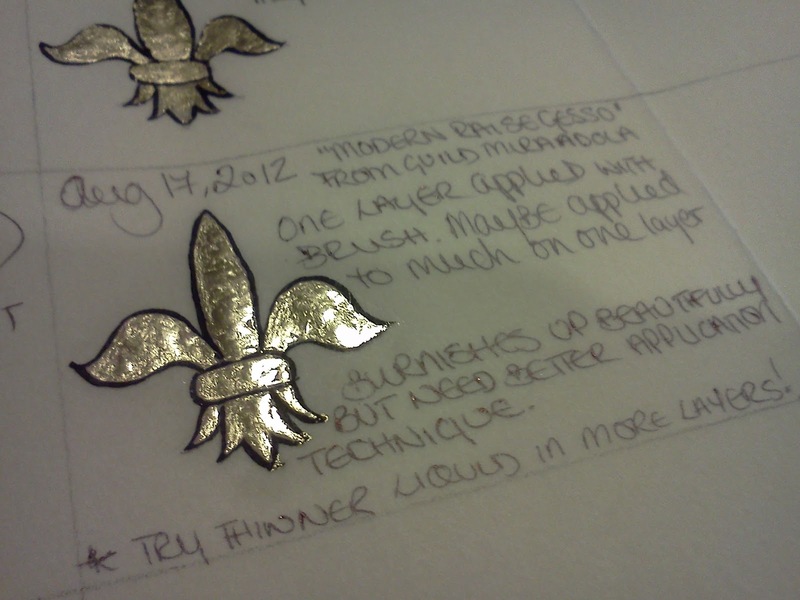 Even though I try to use as much of the gold leaf as possible, there are always a few small scraps. These I carefully collect and am storing in a glass jar until I have enough to experiment in making shell gold. 1 - Most other mordants seem to require six or more diaphragmatic breathes to activate their tackiness sufficiently for gilding. 2 - I learned this the hard way with two pieces that were given out at Pennsic 40 (2011). They were gilded in the humidity controlled environment of my home in upstate New York, but once exposed to the heat and humidity of Coopers Lake, PA they became super tacky again, allowing anything to stick to them. 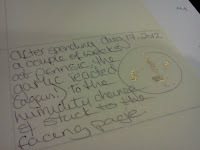 This resulted in the gold-leaf coming off my works and sticking to anything it came into contact with. Cennino D' Andrea Cennini. The Craftsman's Handbook. The Italian "Il Libro dell' Arte." Translated by Daniel V. Thompson, Jr. New York: Dover Publications, Inc., 1933, by Yale University Press. Hamel, Christopher de. Medieval Craftsmen: Scribes and Illuminators. London: The British Museum Press, 2009. Print. 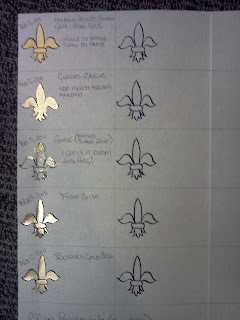 Whitley, Kathleen P. The Gilded Page - The History and Technique of Manuscript Gilding. New Castle, DE: Oak Knoll Press, 2010. Print.